HELLO! 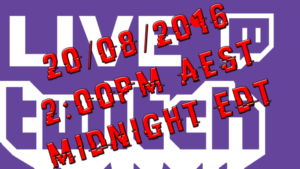 Join us on Saturday 20th August AEST or Friday 19th of August EDT (Thats midnight for you folks!) for a LIVE STREAM of Episode 12 on our Podcast! There will be cursing, and inappropriateness, but we’ll keep it cool! Visit this page for Stream Link and Details, closer to the Day! ← Nvidia Unveils GTX1060, Specs, Price at AU PASCAL Launch Event!